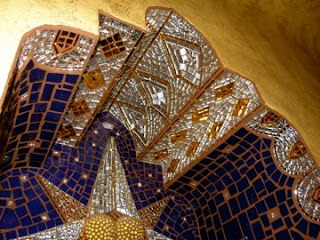 You are currently browsing the category archive for the ‘Commercial Installations~Mosaic’ category. Project: Design and install milagro inspired mosaic pieces within column pedestals of the altar themed bar area of The Mission, a Pan American restaurant located in an historic church in down town Syracuse, New York. 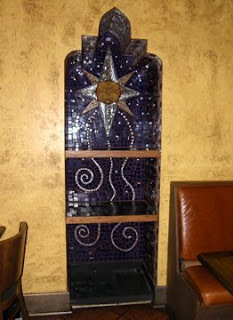 Project: This is an installation I did for a Moroccan themed restaurant, La Cena in Fayetteville, NY. 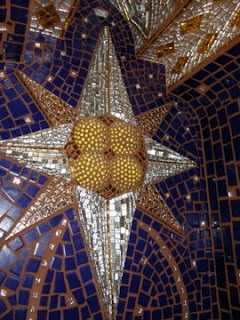 Inspiration for the star motif came from the ceiling mural. Materials: Ceramic tile, miniature glass marbles, mirror, mirrored stained glass, particle board, styrofoam, mastic and tile grout.